Engineers from both countries will design the MTA from scratch, starting from the drawing board to build a product that would have no direct rivals in terms of its specifications. Moscow and New Delhi have finally come to an agreement over the joint development of a medium-lift military transport aircraft under the MTA programme. The plane should replace the ageing An-12 and An-26 fleet, while becoming an alternative to the American-made С-130 Hercules recently purchased by the Indian Air Force. By entering into this contract, Russia is hoping to restore its seriously weakened positions in military and technical cooperation with India, while India is aiming to achieve transport independence from outside suppliers. The contract for МТА development and manufacture has been signed between the Russian-Indian joint venture MTAL, as the customer, the Indian corporation Hindustan Aeronautics Limited (HAL), and the Russian company UAC-Transport Aircraft (TS) as the contractors. The project is valued at $600 million, half of which is to be invested by the Indian Government through state-owned HAL and the other half by Russia through the state-owned corporation Rosoboronexport and the United Aircraft-Building Corporation (UAC). Representatives of both countries’ defence ministries will monitor the aircraft’s compliance with the requirements at every stage. India holds a 50 percent interest in the joint-venture, with the Russian state-owned companies holding 25 percent each. UAC is expecting the imminent arrival of a big group of Indian engineers in Moscow to start joint work on the project. UAC-TS has already prepared all the requisite engineering and technical infrastructure for them to work together with their Russian counterparts. The МТА project is a milestone for both countries. India is Russia’s strategic partner in the field of military and technical cooperation. More than 80 percent of its weapons and military equipment is Soviet or Russian-made. Moscow is planning to supply more than $14 billion worth of armaments and material to India by 2015 alone. Yet, for a number of political and technical reasons, in recent years India has been increasingly opting for US- and EU-made aircraft. Just recently, Russia has lost a series of key tenders to supply India with light fighter jets, military transport planes, assault and heavy-lift cargo helicopters, refuelling planes, and anti-submarine aircraft. The combined value of those deals runs into billions of dollars. One of the main reasons for these setbacks is that New Delhi has all but exhausted the list of Russian weapons- and military equipment-related know-how and would rather move forward by receiving not just the equipment, but also the technology required to design and manufacture it. It is precisely along these lines that the super-sonic cruise missile BrahMos is being jointly designed as part of the 5th generation fighter jet development project. The work on the МТА is in a similar vein, with engineers from both countries designing the new plane from scratch, starting from the drawing board to build a product that would have no direct rivals in terms of its specifications. That said, the project was hanging by a thread until the last moment. The Ilyushin Aircraft Design Bureau first started talks with HAL over a new military transport plane back in 2000. The partners signed a memorandum on the start of joint development of the МТА in 2001, hoping that the new machine would be ready for its maiden flight three to five years later. 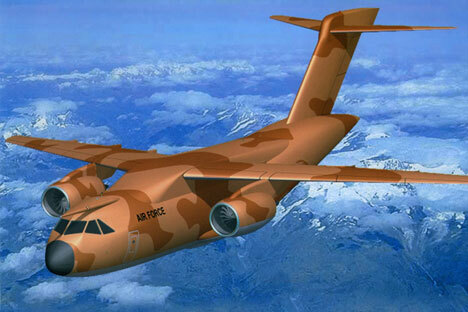 The Indian Air Force was planning to replace its fleet of medium-lift military transport aircraft completely by 2013. In 2002, India and Russia agreed to set up a JV to produce the plane. Subsequently, however, the project stalled. For reasons unknown, nothing had been done by 2007. HAL announced, meanwhile, that it was going to look for other partners for this project among the United States’ Gulfstream, Italy’s Alenia Aeronautica, and Brazil’s Embraer. Desperate to get new planes, the Indian Air Force eventually bought the American-made С-130 Hercules in what appeared to be a fatal blow to the МТА project. Their new partner has been reluctant, however, to transfer the Hercules technology or manufacturing licence to India. And for New Delhi, this is a deal breaker when it comes to bilateral cooperation. As a result, HAL was forced to rekindle the moribund negotiations with UAC, especially since examples of joint development of high-tech equipment had emerged by then in the Russian-Indian military and technical cooperation. An intergovernmental intellectual property protection agreement has been signed, automatically resolving many issues surrounding МТА development. Both parties are now upbeat about the project’s outlook. They say that, once the МТА is up and running, it would not only meet their own needs for medium-lift military transport aircraft but would also enable them to tap into markets in third countries. UAC is hoping that, by 2015–2020, the new transport plane will become an alternative to the An-12, An-26 and the American-made С-130 Hercules. A relatively low price tag is a substantial competitive advantage for the МТА, as are the advanced technical specifications being engineered into its design today. Engineers envisage the МТА as a twin-engine, all-weather plane with a range of 4,700 kilometres and a carrying capacity of a 12,000 kilograms payload or 2,000 kilometres with a 20,000 kilogram payload, capable of flying in any geographical or climatic conditions, day or night. The plane would be able to take off and land at high-altitude aerodromes up to 3,300 metres above sea level, including on unpaved runways. The МТА will have to meet the global fuel efficiency standards. As a military transport aircraft, the МТА would be able to carry up to 140 troops or to land up to 90 paratroopers or to haul and land military cargo and equipment with or without parachutes. The Russian-made Il-214 medium-lift transport plane will serve as the starting point for the project. The Russian Air Force has already said it would acquire at least 100 new machines. India will buy a smaller number than originally intended. Instead of 105 planes, the Indian Air Force is now going to buy only 45 new МТАs for its own needs. The MTA is expected to make its maiden flight in 2017, with serial production scheduled to start in 2019.